PLEASE NOTE: OUR CONTACT NUMBER IS 076 523 0348. 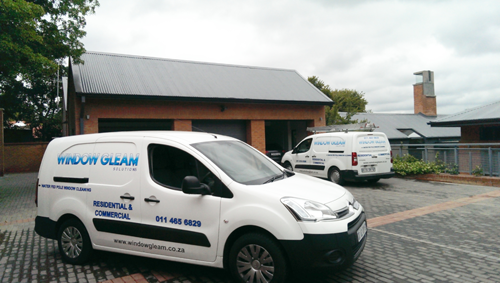 Established in 2007 Window Gleam Solutions, provide a professional window cleaning service for all sectors of the market, which include residential, commercial and retail properties. Our coverage area encompasses eleven zones throughout greater Johannesburg and Midrand. We are also pleased to announce that our Tshwane/Centurion agency is now in full operation. External cleaning is executed mainly by the Water Fed Pole, purified water method. Up to four storey level windows are cleaned from the ground using the latest in carbon fibre water fed poles. Internal work is undertaken by the more traditional method, using squeegees and any required accessories. Properties such as apartments, with multiple external windows are serviced by Window Gleam Solutions teams at rates from R78.00 per apartment. Free standing properties ranging from 150m/2 to 1400m/2 are serviced at rates based on duration for completion rather than by volume of the glass. Window Gleam Solutions are extremely proud of the company’s safety record from when the company started in 2007 up until today, with zero incidents having occurred requiring Workman’s Compensation or insurance claims. Colin Yates the company owner introduced the Water Fed Pole concept to South Africa in 2006. This followed extensive research over a 6 month period involving hands-on, face-to-face interaction with industry participants in the United Kingdom. This proved to be invaluable in terms of the start-up of Window Gleam Solutions business here in South Africa. 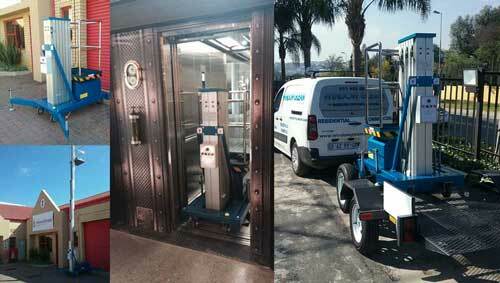 Elevate 2-10 hydraulic lift platform. The small footprint of these compact units allow for easy maneuverability, quick erection and a cost saving service for our clients. We provide safe and worry-free residential window cleaning services throughout the whole of Johannesburg. No job is too big or small when it comes to our Commercial and Retail window cleaning services. A one-stop shop for all of your water-fed pole window cleaning equipment. From solar panel cleaning to glass protection and treatment. We aim to offer more. Looking to make use of our services?